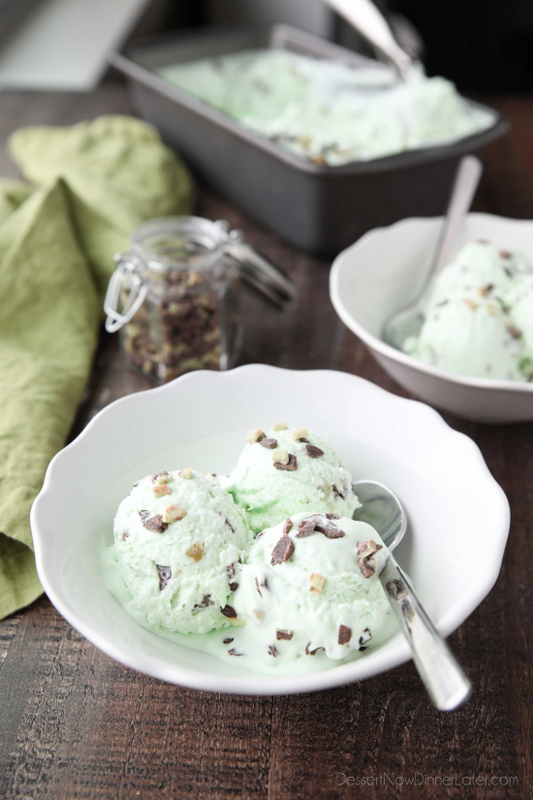 Mint Chocolate Chip Ice Cream - Dessert Now, Dinner Later! 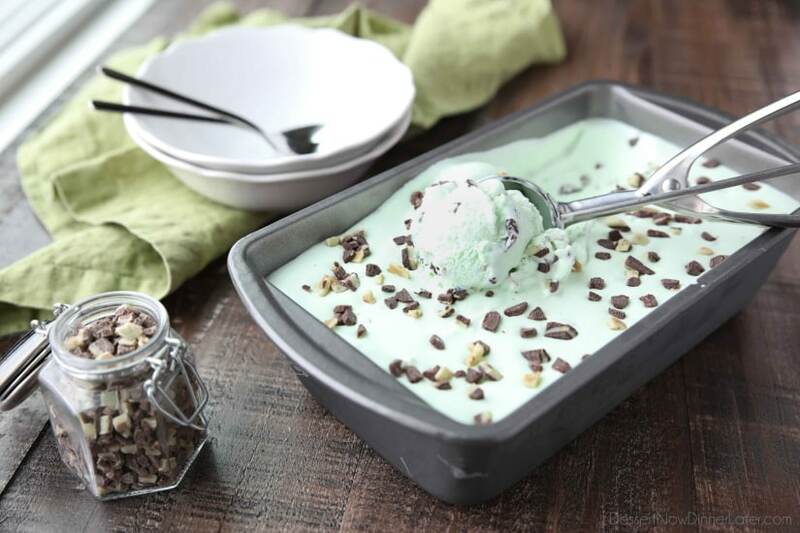 No ice cream maker required for this no churn Mint Chocolate Chip Ice Cream. It’s creamy, with just the right amount of mint. Use Andes mint chips for extra mint flavor, or keep it classic with mini chocolate chips. 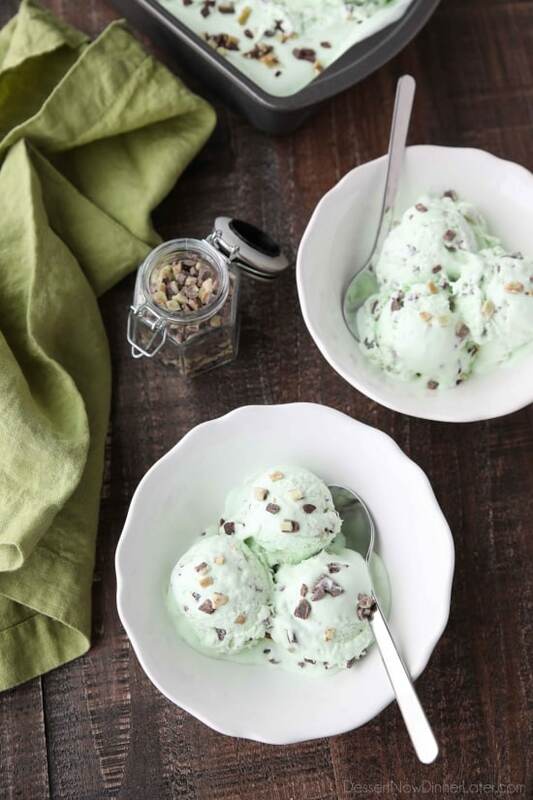 According to the International Dairy Foods Association, mint chocolate chip ice cream is one of the 5 most popular ice cream flavors — ranking in 4th place, and it’s easy to see why. 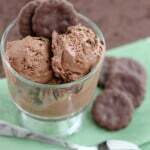 It’s creamy, sweet, and chocolatey with bright, refreshing mint. 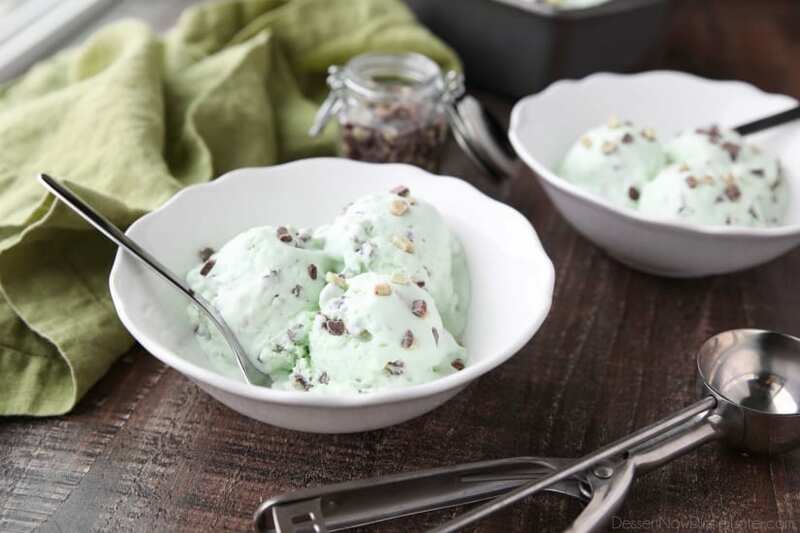 Mint is well-known as a traditional palate cleanser, so mint chocolate chip ice cream is the perfect dessert to have after dinner. It also makes a great flavor for cookies! 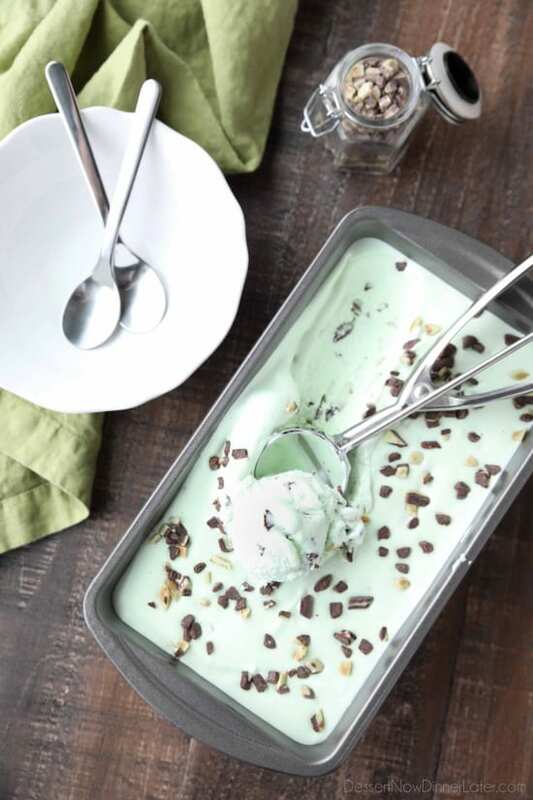 This mint chocolate chip ice cream recipe is super easy to make without an ice cream maker. 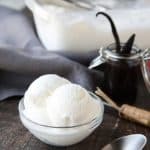 Simply whip heavy cream to stiff peaks, and fold in sweetened condensed milk, mint extract, green food coloring (optional), and the chocolate of your choice. 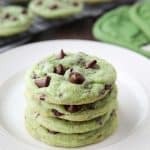 I used Andes mint baking chips for extra mint flavor, but mini chocolate chips, or a chopped up chocolate bar work great too! Pour the ice cream mixture into a freezer safe container, cover with a lid or plastic wrap, and freeze until solid. I like our ice cream a little soft still, as you can see in the pictures. It will freeze completely solid, so no worries about that. MINT OR PEPPERMINT FOR MINT ICE CREAM? When I think of mint chocolate chip ice cream, I automatically think of the “green” mint — spearmint or cremé de menthe. You may use either peppermint or (spear)mint to flavor this recipe, since you are making it at home. Use which ever is your personal preference. In the bowl of a stand mixer with the whisk attachment, whip the heavy cream until stiff peaks. 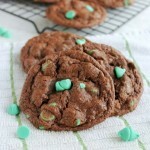 Pour in the sweetened condensed milk, mint extract, food coloring, and mint chocolate chips. Gently fold until just combined. Empty mixture into an 8-cup (2-quart) freezer safe container or large loaf pan. Cover tightly with a lid or plastic wrap to prevent freezer burn. Freeze 4-5 hours or until firm. Freezing overnight is recommended. Keep frozen. Hello Amber. 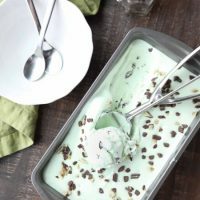 I think this is the best Mint Chocolate Chip Ice Cream recipe I’ve ever try! I made this twice already at this was absolutely delicious. My wife and kids love it! Thank your very much for sharing this with us, Amber!